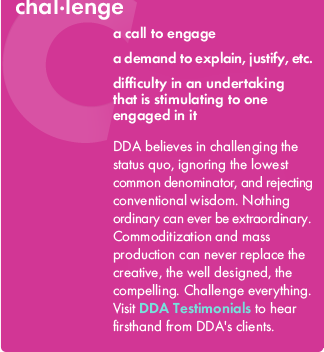 DDA Medical™ does what others say can't be done. 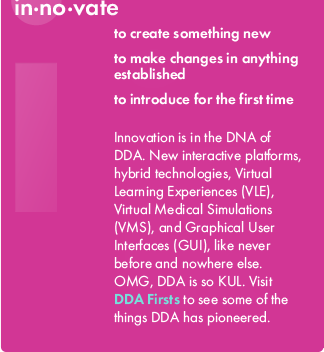 Combining state-of-the-art technologies with a professional and creative team dedicated to exploring new ways of engaging audiences, DDA Medical™ has inaugurated a new standard for innovative digital design. 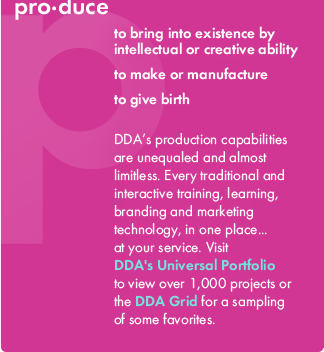 DDA Medical™ understands the challenges that medical organizations are faced with everyday. Whether it's the ever-changing regulations of the medical industry, the continued adoption of new technologies and the resultant changes to medical procedures, or the development of new medicines and therapies, medical organizations know that they must employ their limited time and resources with the utmost care if they are to face the challenges ahead of them effectively. 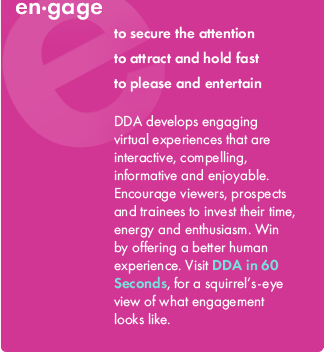 DDA Medical™ is uniquely positioned to help them do this by providing a large range of services that can be integrated to create memorable, engaging user experiences that are simply unmatched. By integrating a vast array of media and technologies-all under one roof-DDA Medical™ offers clients original websites, mobile and online applications, informative and promotional videos, eLearning platforms, procedural simulations, and more that engage users on multiple levels with a richness and detail that is unlike anything that has come before.